Wednesday afternoon, I had one mood collide with another mood. I wanted to "purge" parts of the house, while at the same time be productive in some way. I went through drawers and cabinets, trying to get rid of something from each area. I retired 3 very holey tee-shirts, and 1 equally holey fleece jacket. I had been in a store the week before, took my winter coat off to try on a new fleece jacket, only to feel embarrassed at the state of my tee shirt underneath. Yikes! I'd worn one of my "only around the house" shirts out in public! So, got rid of the worst of the worst. Recycled a bunch of product boxes (why do I save these things?). Found loads of bars of soap (and I thought we were about out of soap -- silly me). These are bars that I've received as gifts over the years. I put them in drawers to add fragrance. Well, it's time to begin using them. We now have the most lovely of soap in all of the soap trays! I also found this vase, this candle and this part of my sea glass collection (the browns and whites). I set the candle aside for the day. Then back to that store where I'd tried on the fleece jacket while wearing the holey shirt. I happened to pass some nice glass candle holders. And I thought to myself, "now that's what I need for the candle that I found!" I was ready to buy one of those holders when I remembered that glass vase. Candle, vase -- I think I may have something here. Now if only I had something to set the candle on inside the vase, that would complete the look. Aha! The sea glass collection that's been gathering dust all these years! 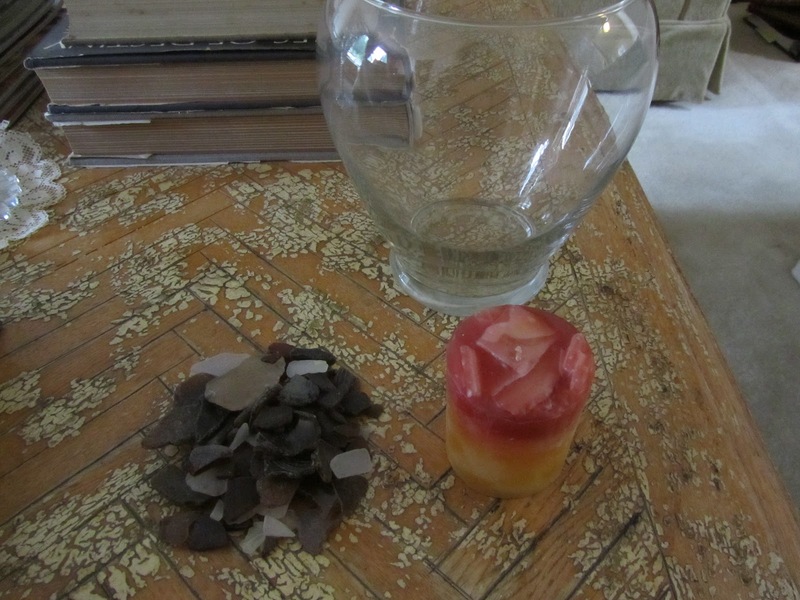 Putting the three together, I now have a nice candle in a holder, for the coffee table in the living room, all using what I had! What fun things have you done lately using what you have? This was about a month ago. But my daughter brought home some K-5 artwork that she was really proud of. I found a picture frame in the closet and some white spray paint in the garage and painted the frame for her "work of art". We hung this together in her bedroom above her headboard. It actually looks really nice, now that it's framed. And she is so proud to show it off to anyone who comes to visit. That sounds really nice. And shows your daughter that you value her work. I bet that really made her day. Way to go! Just yesterday I pulled together a nice meal for guests with what was in my freezer and pantry. My son, daughter-in-law and their two young children stopped by in the afternoon to visit, after tromping through the pumpkin patch. My husband and I really wanted them to stay for dinner, as well. We had planned on soup and bread for dinner. But with guests I wanted to do a nice table for them. From the freezer, chicken breasts (the boneless kind), green beans from this summer's garden, half a cake from a couple of weeks ago, and some brown and serve dinner rolls. Then from the pantry, a box of stove stuffing, canned pineapple, olives and pickles. In under an hour I pulled together a very nice chicken dinner with stuffing, some vegetables and fruit, rolls and extras. We even had some cake for dessert with our coffee. Excellent job with the last-minute dinner! Isn't that such a great feeling to put this sort of thing together using only what you had on hand?! Wish I could have been there! Ha! The soap. I have that too, thanks to Mother's Day. Every year my husband takes our daughter out to buy something for me and they always buy me soap! I have a pile of boxes, too ... you know, "just in case I need them". I think it's kinda fun to use what you have. I told you about my daughter's Halloween costume (mac n cheese)--we used an old sweatshirt of hers and toilet paper rolls. And instead of buying new stuff to decorate with, I try to reuse decorating items. I donated our stash of motel soaps/shampoos to a homeless shelter (I have eczema and try to avoid "smelly stuff" when I can) but like Helen, I often cook with what I can dig up in my freezer/pantry. I think it forces my brain to work harder by doing this rather than running to the store constantly. I think I save these boxes, like you said, "just in case", for returning if an item breaks down too soon, or sending to one of those authorized repair centers, or if I want to resell the item on Ebay or at a garage sale. But this week I did get rid of a lot of the boxes. Really good idea to donate the hotel soap/shampoos to a shelter. Helps to clear out some stuff from your house, but more importantly really benefits those who are homeless. I enjoy trying to do things with what I've got. The challenge is fun, and much more rewarding in the end, than just going to the store and buying things. I wish I could see how your daughter's costume turned out. But my mind's eye pictures it well! 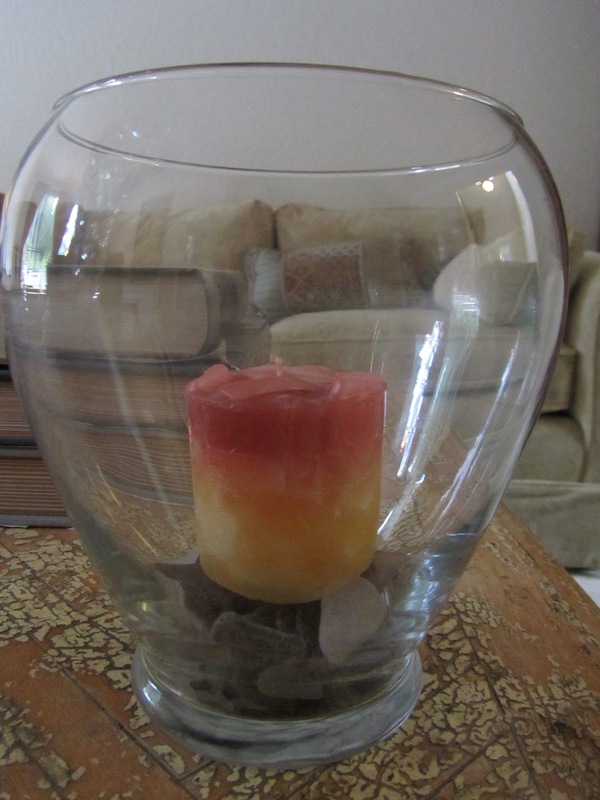 Your candle looks lovely with the sea glass in that vase. We used to go looking for sea glass, but lately all we find is plastic so I quit looking it depressed me. Oh, that would depress me, too! I love sea glass. My favorite are the blues and the greens, but mostly I find browns. It looks beautiful! Part of me hates it when the days get shorter, but the pyromaniac in me LOVES the opportunity to play with candles and oil lamps! I haven't created anything lately, but I did relegate a few "around the house" t-shirts to the rag bag, and used great restraint at the thrift store. I had to pick up a few things because I just didn't have the right clothes for keeping warm on long bike rides. But while I was there I was SOOOO tempted to bring home more clothes that I don't need. BUT... instead of buying them I decided to re-arrange and re-purpose the clothes I already have. I took all of the remaining "nice" and "work" clothes (which seldom get worn these days) and moved them into the spare closet - and decided that some formerly "nice" clothes could now be downgraded to everyday wear. This allowed me enough room to hang up some of the things that had previously been deemed "too everyday to deserve hangers" and free up a drawer for biking clothes. Now my closet is full of clothes that I actually wear, and there is room in my dresser drawers for the things I use. Much better! What a great idea -- downgrading clothing. I have way too many clothing items that are "work worthy", but the work I do doesn't require this sort of attire. I should just repurpose some of my nicer clothes for everyday wear. Hmmm, this could save me a lot of money and hassle shopping!